Belarus may be better known for exporting tractors and potash, but the country is also home to an emerging tech industry that has produced some global hits like World of Tanks, a widely popular multiplayer online game. World of Tanks has inspired the latest livery sported by one of Belavia's Boeing 737-300s. I do not play this type of games, but the design is certainly eye-catching, even more when considering that Belavia, the national airline of Belarus, is not precisely the most innovative airline out there (its normal livery and corporate image have a kind of a retro feel to me). 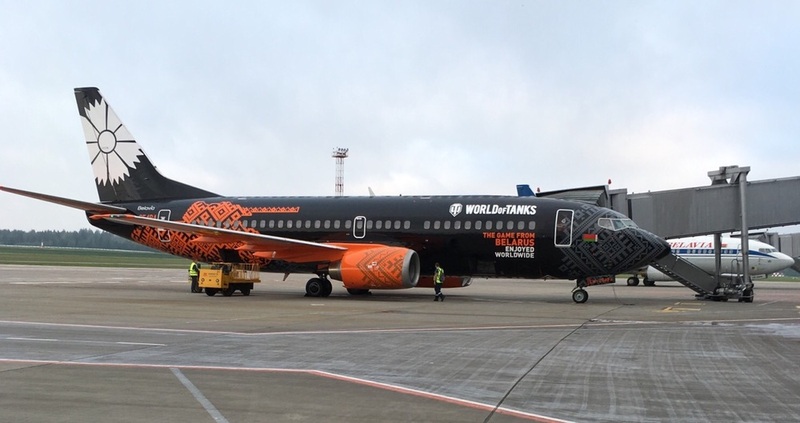 Dortunately, a friend of mine just happened to be at Minsk airport shortly after the World of Tanks livery roll out and was able to sent me this picture, with the aircraft fresh from the paint shop. For more images of Belavia's World of Tanks Boeing 737, check out posts by Russian bloggers Marina Lystseva, from the new livery presentation ceremony, and Sergey Martirosyan, to see how the new livery was created. Air New Zealand premieres "Safety in Hollywood"